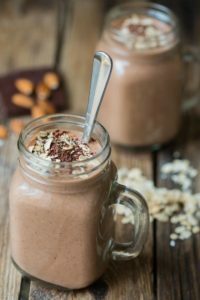 A delicious rich and chocolaty smoothie that is high in protein, vitamins and minerals. A great option for breakfast, snack, or light meal throughout the day. Add all ingredients into a a blender (or Thermomix) and enjoy! Add a few cubes of ice for the perfect summer iced smoothie. *ThermoPhase Detox Essentials powder is a special rice-based protein powder that is available to purchase from MNMC. It contains a variety of herbs that may assist with supporting the liver with detoxification.